For comic fans the world over, Christmas is an event where people you know gift you something Superman. Sure your favourite character may be Luke Cage, Firestorm or Black Cat, but Superman is what they know in pop culture, so Superman is what you get. 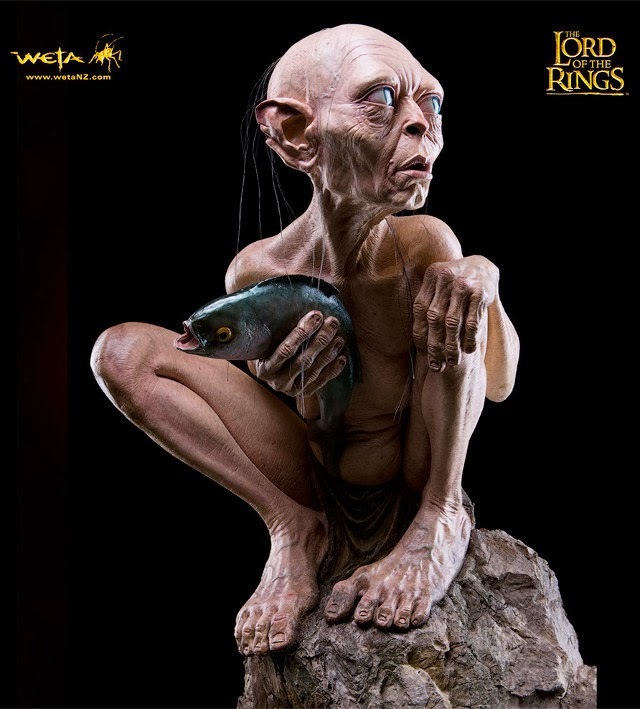 To help point peeps in a not so primary coloured direction, each week leading up to the big day I'm putting other ideas out there, like this, a life-sized Gollum statue from the good Kiwi folk at Weta Workshop. For all of you who don't know what a 'Weta' is, it's a large cockroach-ish insect native to us here in New Zealand. Some folks hate the sight of them, and it's a safe bet, those same folks will be squeamish over this statue, with it's googly eyes and balding head - but hey, even with a $2,999 price tag, what's not to love? Made from fibreglass at 3'6" tall, it's the ultimate bedroom accessory or dining table centrepiece. If only it came with a sound chip that on sensing motion screeched "I hates Hobbitsises", then the cheques would write themselves. What do you think? To order yours, click the jump.